I made cole slaw twice this week. I love the creamy dressing and the crispiness of the cabbage. So fresh and raw. The first time I made it I followed a recipe from WILL DO THE DISHES blog. It was a fantastic recipe and if you haven’t yet, you must go visit this wonderful blog. Today I am posting the second cole slaw I made. WILL DO THE DISHES cole slaw was to “write home about” so I decided to make a second batch. I remembered we had a little leftover shredded beetroot salad in the refrigerator. I tossed it in and was so pleased with the resulting pink hue! The beetroot salad was already lightly dressed with a balsamic vinaigrette and contained sunflower seeds. A nice fresh slaw to place on the side with your barbecue chicken and potato salad. Shred, chop and julienne your vegetables and place in a large bowl and mix well with your hands. In a medium size bowl mix together parsley, mayonnaise, dijon, black pepper, sugar and vinegar and set aside. Place sunflower seeds in a non stick skillet over medium high heat, shake the pan occasionally to toast both sides. Remove from heat and allow to cool. Combine the dressing with the vegetables and mix well. Add the sunflower seed and continue to toss until well combined. Chill before serving. Thank you Rosa. Haven’t made any changes (consciously speaking) in my photographs. I keep thinking I should though! I feel like I do the same type of photograph every single post. I am enjoying your blog these days! Wonderful story-telling and your paintings are wonderful. It looks as beautiful as it must taste. Printing it down to save! Thanks! Thank you Karen. You will not be disappointed if you make it. The color is so beautiful, I love cole slaw this is fabulous!! Those anti oxidants are just jumping out at you!! I know! The color really made this a pleasant side! I love cole slaw too and this was the first time I added sunflower seeds. Really good. Love, love, love red cabbage! It’s so delightfully crunchy and delicious! It’s funny how we’re eating the same foods, cos I just made salad with red cabbage the other day! Will post about it soon too! Big hug! Well, I know for a fact yours was awesome. Seriously, I was going to make it again two days later. Love you blog by the way! Although it can certainly be eaten year-round, in my mind cole slaw is a Summer dish, sitting right next to a burger or hot dog and eaten in the yard or at a picnic table. I bet yours would be perfectly at home there, too. It’s a great recipe and thanks for sharing. I agree. Year round. Although I don’t usually think about it until I have barbecue chicken. I love how the barbecue sauce and the sauce from the slaw sort of mix together. So delicious! This is a beautiful coleslaw! Thank you Fae! It is so fun to eat colorful food. Makes me smile. Pink cupcakes make me smile too! I echo everyone else’s opinions – this is such a beautiful coleslaw! Red cabbage definitely makes for a much more interesting bowl of ‘slaw goodness. I like the addition of beetroot and sesame seeds too. Thanks for sharing! Thank you Laura! Typically I am not a pink fan, except when it comes to food (I have noticed). Pink food makes me happy. Pink cupcakes, pink slaw, pink smoothies, an instant smile appears! There’s (almost) a coincidence. I read WILL DO THE DISHES post couple of days ago and suddenly thought, why on earth have I never made slaw. Well, I still haven’t – yet. I loved that theirs was so delicate and wispy to look at. Doubt if my knife skills are deft enough. Hmm…as for my sharp knife – that isn’t sharp. Maybe next week! – Loving all of your ingredients. What a whimsical word used to describe cole slaw. Wispy. Makes me like it even more. Another coincidence, while making this cole slaw I thought I could really use some better knife skills, which resulted in a book I picked up just yesterday “kitchen knife skills”…I’m refusing the monster food processor and mandolin…we’ll see, I start practicing today! Good luck! As for mandolins, I would only use those dressed in plate armour from head to toe! hahaha. I’m laughing now. I agree. so vibrant!! (thanks to you cooking & photography! )– love cole slaw– tastes like summer. I’ll be making this. thanks! I just love creamy coleslaw. 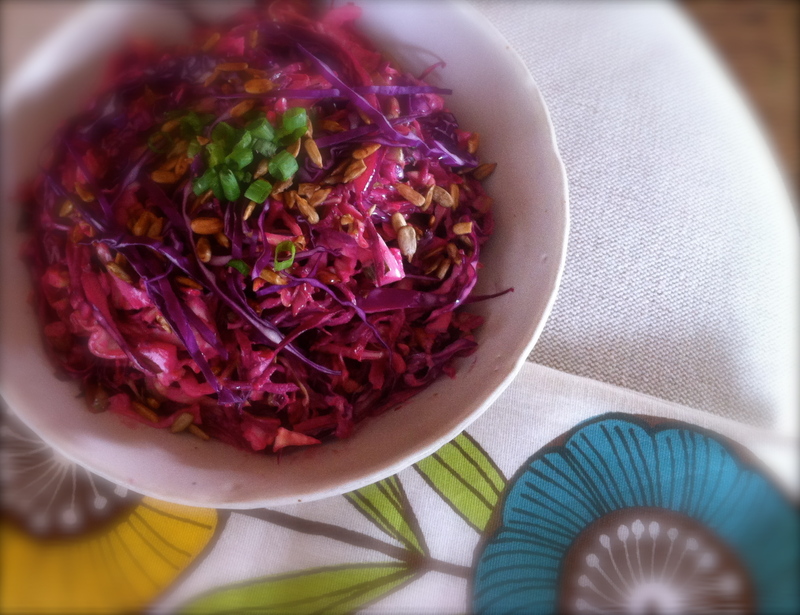 I too made a slaw once with the red cabbage… I just LOVE that purply colour! What a great combination of ingredients. It will add so much color and flavor to a meal. I’ve never been tempted to make coleslaw … but you’re changing my mind! 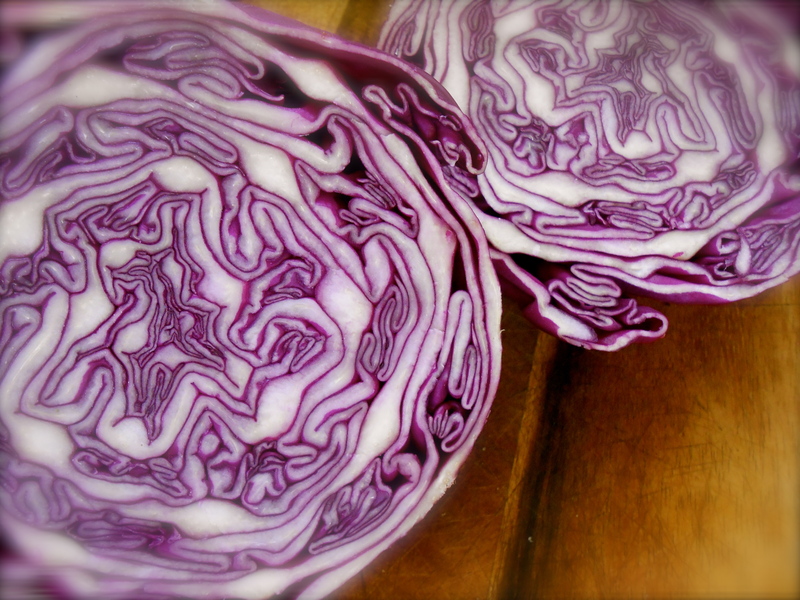 I absolutely love red cabbage – it’s so photogenic! I really like your idea of jazzing up coleslaw, great results! Looks delicious and the colour is very attractive. I can’t remember when I last made some slaw, but now I’m tempted to make one. Thanks for sharing and have a lovely week! You are currently reading pink coleslaw at COTTAGE GROVE HOUSE.